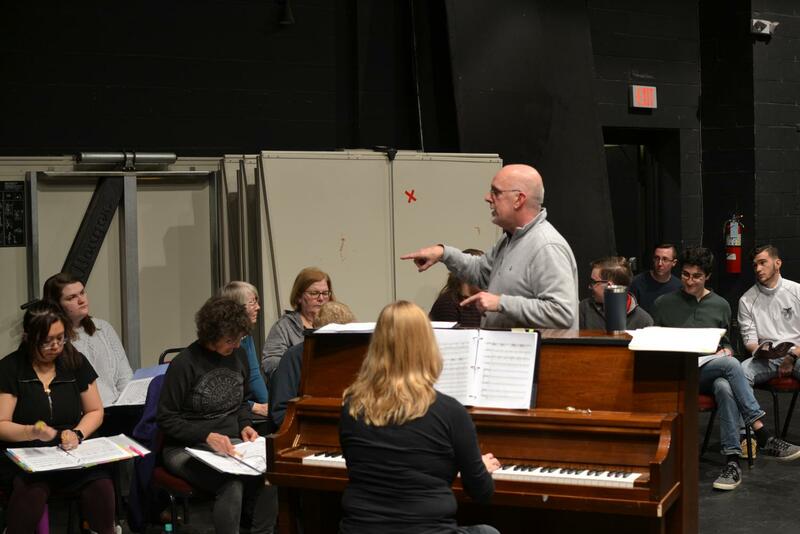 Professor Doug Byerly, who plays the lead role in “Sweeney Todd,” directs a rehearsal. Opera AACC will present the musical thriller “Sweeney Todd” this February. The performance honors the 40th anniversary of the debut of the musical on Broadway. The production, based on the 1979 book by Hugh Wheeler, tells the story of a barber, the eponymous “Sweeney Todd,” who murders victims in his London barber shop and gives the meat to Mrs. Lovett, who bakes it into the pies she sells. Doug Byerly, chair of the performing arts department and lead actor, said he wanted to choose something that appealed to both students and faculty. “It’s a dark story, but in that dark story we find our humanity,” Byerly said. The company will use the Stephen Sondheim version of the music and lyrics in its adaptation. The opera will differ from the 2007 Tim Burton movie starring Johnny Depp. Byerly said one of the complications in adapting “Sweeney Todd” includes learning the musical harmonic language that Sondheim uses. The performers started learning the production months in advance after August auditions. The production also has professional musicians and actors working alongside students and faculty. 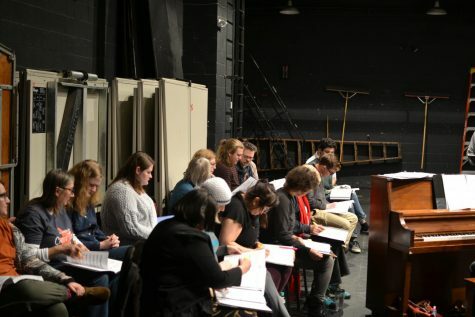 “Sweeney Todd” performers look over sheet music. “Opera and musical theater are two of the most expensive art forms to produce,” Byerly said. Part of the production costs involves visuals, set design, costumes, musicians and rehearsal time. Byerly said he most looks forward to the performance. Byerly said he assigns roles based on an actor’s voice type or how well the actor captures the character. The musical director, faculty adviser, accompanist and the director cast the show. The director had final say, as the production ultimately relies on his vision to see it through. Byerly said he was “scared sh–less” about performing “Sweeney Todd,” but said he has faith in the company. The performances will be from Feb. 16-23 in the Kauffman Theatre. “I hope people come to ‘Sweeney Todd’ and are challenged by it,” Byerly said.